What a difference a year makes. Last year I tried to do a little home automation. First I bought a whole bunch of Zwave stuff including a Mi Casa Verde Vera 2, a Trane remote energy management thermostat, and a pile of light switches. I spent a couple of weekends trying to get the stuff to work - it actually did for about 10 minutes, and then the controller got corrupted somehow, the new firmware had to be installed from a Win XP machine.... and well, yah. So I thought, maybe the high priced route? So I signed up with Schlage for their Zwave controller and paid service (Mi Casa Verde is free after you buy the controller) and another few weekends of screwing around and the project was abandoned. The ironic thing is that my old thermostat was programmable, and the Trane needed the controller to be programmable, so for most of 2012 my functionality was worse than 2011 and before. Friday I put in the Nest thermostat. Done in 10 mins. I can control it from my iPad, my Android phone, or any PC. Done. Awesome. Now it is learning to program itself from our behavior. Awesome. I cannot wait to see what Tony Fadell and his team introduce next. No matter what it is --- I will buy it. It is beautiful, it works, and it is an absolute pleasure to interact with the company. About that interaction. I have never called them, or emailed them, or tweeted to them, barely had to read the instructions.... so what is this "interact with the company"? The thought and care that the Nest team put into their product speaks volumes. It is just as magical to see it on my wall as it was to hold 1,000 songs in my pocket with the first iPod. I am sure many companies strive for this kind of perfection... but almost no one can do it. Way to go Tony and the Nest team. 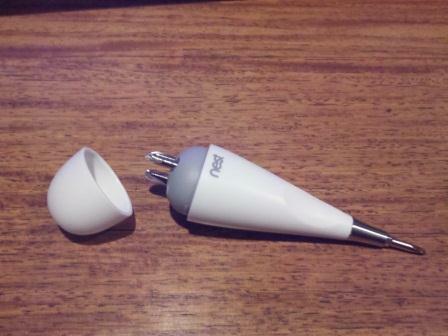 Here is a picture of the screwdriver that comes with the thermostat. Need I say more?